We’re in June, we’re on Block 5 of the Mystery Quilt and things are looking fabulous everywhere!! There are some stunning blocks being made……some with kits that are looking a lot like the original quilt, including very wonderful stitcheries (far better than mine!)….. and some with your own choices of fabrics which are great fun for me to watch, as I have no idea what they’ll turn into, a mystery for me! Breakfast over with, other strange thoughts including, I need coffee and how wonderful my hubby is….. I mentioned a new filter coffee thingy would be good, I like pots of coffee! 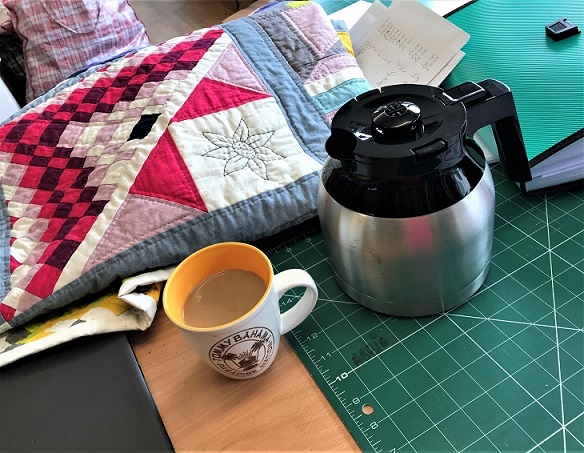 He ordered us a new maker, it has an insulated jug to keep the coffee warm, added happiness, I’ve just realised, it can come with me into my quilting cupboard!!! (humongous amounts of bonus hubby points!)……. Check facebook notifications, emails, website notifications……find our very own UKQU-ing Sylvia asking questions about my next, up and coming mystery quilt…… bugger!!! I’m gonna have to write my blog this morning then…………. On the way to work (all 20m of it) I detour to check out the show view from the front garden and take pictures…. 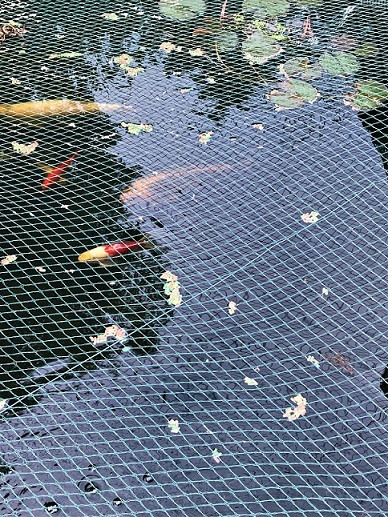 better feed the pond fish! ……quilt upon quilt design right there! Fish already feature large in a lot of my design work. The bright light today reflecting on the water and around the lillies…….abstract quilt joy right there! Then more coffee and sadness, my favourite mug, Tommy Bahama, reminds me of the tragedies underway in Hawaii & Guatemala. 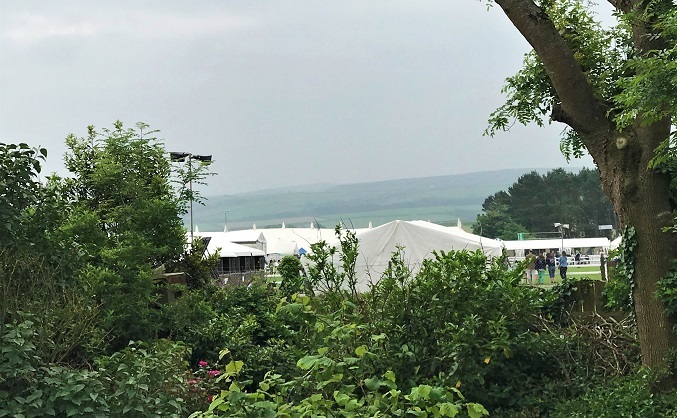 🙁 What they wouldn’t give for my slight inconvenience of a County Show……..
How lucky am I? How lucky are we? We all have stuff going on in our lives, we need to remember that. We all react differently to life’s happenings, maybe we could all be a bit more understanding and tolerant of each other? 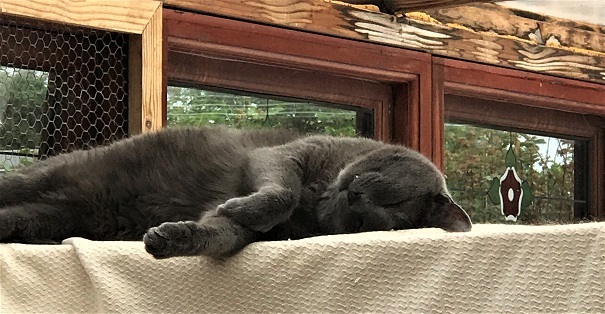 ….. and then to work, the next quilt……. 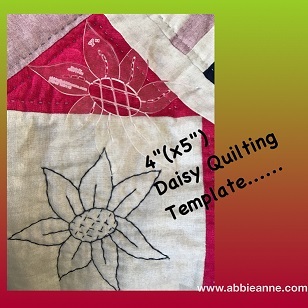 my next therapy session, for that is what quilting is to me and many……. 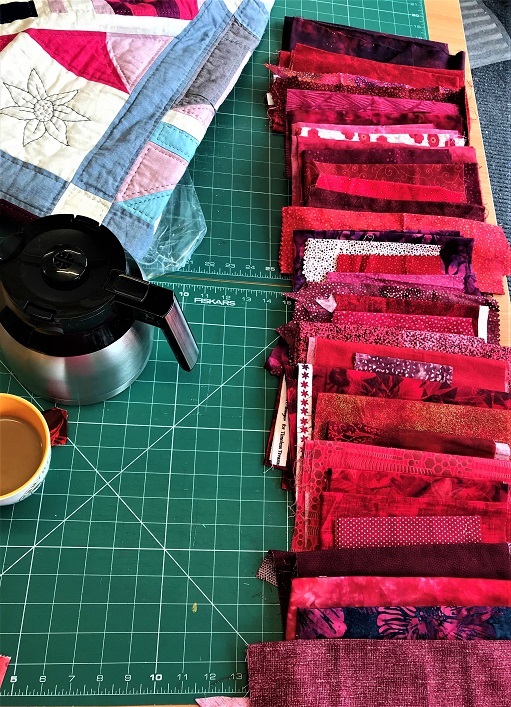 so (Sylvia), the next Mystery Quilt…….Ruby’s & Cream….. The background is pieced in one colour range, the design is appliqued over the whole quilt top in the other colour range……. You’ll need lots of different fabrics, even just small scraps can be used up (or maybe not? we all think differently after all) . Allow 1/2m for sashings and about 1m for a border if you like borders……. but both the sashings & borders could all be odd!!! 🙂 approx. finish size is 50″ x 70″ without borders. This quilt can be made by machine or hand, or mix it up even?! Within several of the ‘blocks’ (I use that term loosely) there will be design choices which will allow both beginners or experienced quilters flexibility of capability and technique choice. As ever, I’ll be available for help & support throughout the making of your quilt. A big mix of traditional & modern quilting. The design is from a painting of mine from about 15years ago, I won a national competition with it…. floral-ish! is all I will say. But it will be different, as I hope all my quilts are. Let me know your thoughts, message me your interest, your questions……..start sorting your stash!! 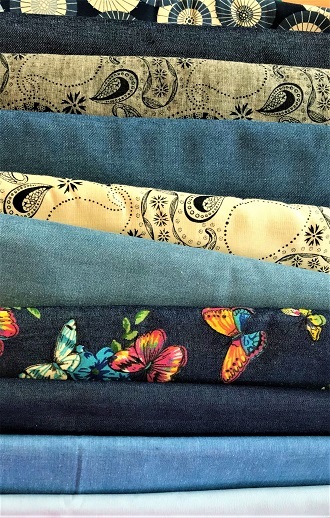 and just so you know…… here’s the fabrics for the one after Ruby’s & Cream!!! 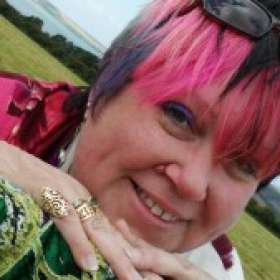 Light weight denims & chambray’s I’m thinking Art Deco………..
AbbieAnne Searle……this is me, Textile Artist, P&Q Nut, Teacher, Speaker, Author (and obviously very shy of course!) Mystery Block 2 & Dragonfly 3 now available……….and STUFF!!! Continuing Mystery’s and their preparation for the quilting Public…. 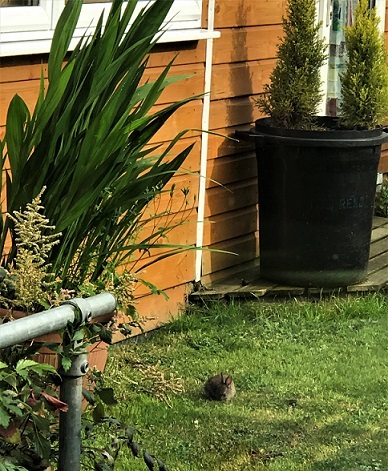 Bondaweb & Mystery stuff!…….